If I were permitted only one type of recipe to work on, it would have to be for condiments. Even the simplest dish can be greatly improved with a good quality sauce, chutney, spice mixture or yes, even ketchup. Ketchup has a bad rep among foodies, no doubt as a result of the association with the over-processed, overly sweet products we find in the grocery store. Maybe we should call it ‘sweet and sour sauce’ instead, but the fact remains that a home-made ketchup has so many uses besides tarting up our macaroni and cheese or burgers. It can be used in dressings, marinade, added to sandwiches, soups, stews and vegetables. I have already given a recipe for wild grape ketchup in a previous post, and I regularly make my own tomato ketchup. Instead of making a big batch of it in tomato season, I just freeze tomato puree, made by heating whole tomatoes, passing them through the food mill and then cooking them down to a thick sauce, to be used throughout the winter as needed. Now I can make tomato ketchup in a few minutes, and change the recipe according to how I plan to use it. Recipes vary according to the spices used: hot and spicy or sweet and tangy. For my recipe here I used sumac powder, but of course you can add any spices or herbs according to what you have around or what kind of flavour you are looking for. This ketchup is not very red, because I used all varieties of tomatoes, including some yellow ones. If colour matters, then use red tomatoes, or even tinned puree if necessary. I have also made yellow ketchup with yellow tomatoes, tumeric and mustard. Mix all the ingredients together in a pot, heat and simmer until the right consistency, about 10 minutes. 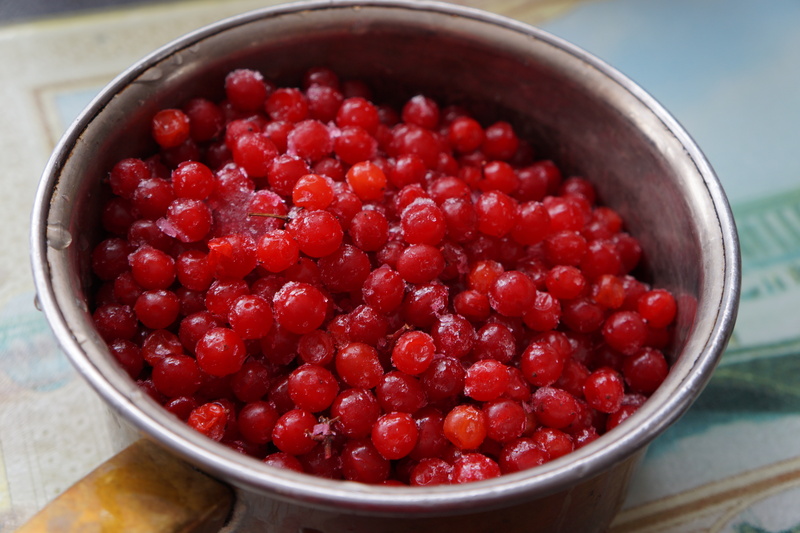 I have still quite a few highbush cranberries in my freezer to use. So far, I have used them to make liqueur, cranberry sauce and candied fruit. The good thing about them is, besides being easy to pick, they freeze well and are even better after being frozen because they become juicier. I was concerned they might be too runny, so decided to add apple sauce, but in fact after I strained them, they were pulpier than expected. I also decided to try a few sweet spices so that I wouldn’t need to sweeten them with too much sugar. Again, other spices can be used, but I was looking for sweet so came up with a mixture of licorice root, cinnamon and fennel seeds. This was made by putting 1 stick of licorice root, 1 stick of cinnamon and 1 Tbsp of fennel seeds in a cup of water, simmering it until there was about 2 Tbsp of dark syrup. Strain this through a food mill or a sieve using the back of a spoon to press it through. Return to the pan, add vinegar and apple sauce. Continue to simmer until the right thickness, another 15 minutes. Categories: condiment, wild fruit | Tags: foraged, highbush cranberries, ketchup, locavore, sumac, wild fruit | Permalink.